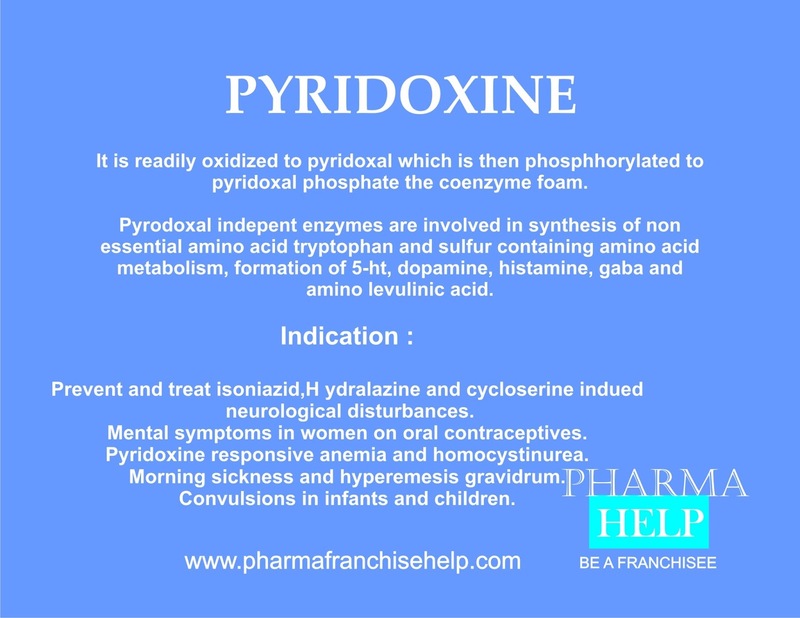 Pyridoxine are readily oxidized to pyridoxal which is then phosphhorylated to pyridoxal phosphate the coenzyme foam. Pyrodoxal indepent enzymes are involved in synthesis of non essential amino acid tryptophan and sulfur containing amino acid metabolism, formation of 5-ht, dopamine, histamine, gaba and amino levulinic acid. To prevent and treat isoniazid, ydralazine and cycloserine indued neurological disturbances. Mental symptoms in women on oral contraceptives. Pyridoxine responsive anemia and homocystinurea. Morning sickness and hyperemesis gravidrum. Convulsions in infants and children.